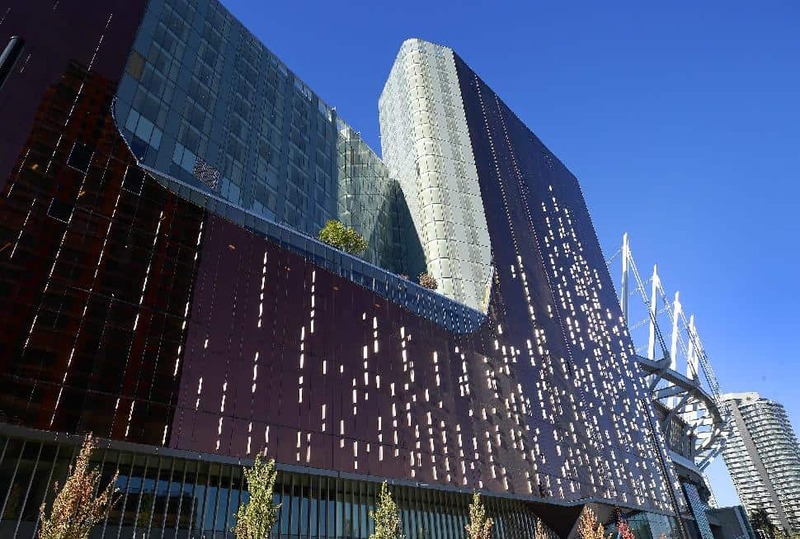 Scott Menke bet big on Parq Vancouver, the city’s new downtown casino and resort. Who is this single-minded Las Vegas transplant, and how did he pull it off? On a brilliant late-June afternoon, Scott Menke strides through the posh lobby of Vancouver’s Rosewood Hotel Georgia. “What’s up?” asks the co-founder and CEO of Paragon Gaming as he extends a hand. At first glance, his aquiline gaze appears haughty, but don’t mistake the tall American’s confidence for condescension. For 20-odd days a month, Menke lives alone in this downtown hotel. 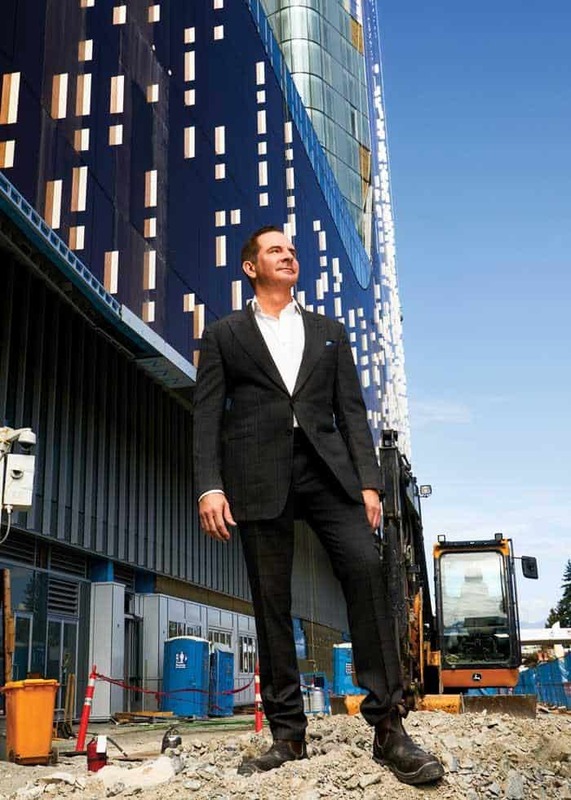 Since 2006, he’s divided his time between Vancouver and Paragon’s home of Las Vegas as the company pushed to build an ambitious destination casino and hotel project, facing blowback from politicians, anti-gambling activists and concerned residents. Some critics have questioned Paragon’s track record. But in the end, Menke got his way: a few blocks south, in the shadow of BC Place stadium, Parq Vancouver opened its doors on September 29. Paragon has dealt with bigger setbacks. In 2011, after the company applied to move its downmarket Edgewater Casino’s licence across the street to what is now Parq, city council approved the relocation. But it unanimously blocked a request to install up to 1,500 slot machines and 150 gaming tables, capping them at the now-closed Edgewater’s 600 and 75, respectively. 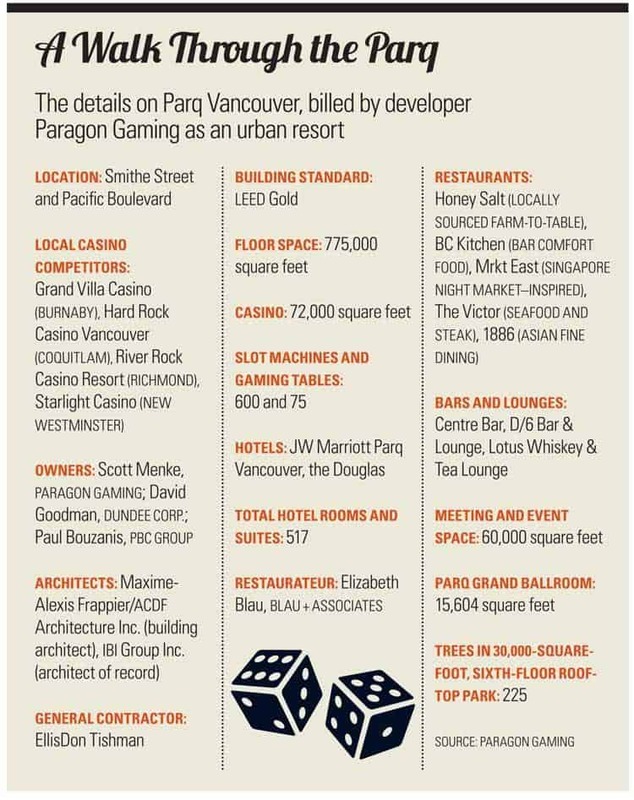 Rather than try to bring Vegas to False Creek, Paragon recast the project as what it calls an urban resort. The $640-million Parq development, a slender, U-shaped building shrouded in orange glass, contains two Marriott hotels, one with 48 ultra-luxury suites. Amenities include eight restaurants, bars and lounges; Canada’s largest hotel ballroom; and its treed rooftop park. Among Parq’s other nods to Vancouver: 1886, its Chinese restaurant, references the year Chinatown was established, and the boutique Douglas hotel name-checks B.C.’s ubiquitous fir. There’s a 72,000-square-foot casino, but it’s on the second floor so guests can avoid it. For serious gamblers, the third-floor high-limit area has private gaming suites. With that rebranding in mind, Menke has been on a charm offensive. In mid-May, he invited local and international media to the U2 concert at BC Place. There he worked the crowd with Las Vegas culinary power couple Elizabeth Blau and Kim Canteenwalla, who oversee Parq’s restaurants and lounges. The next morning Menke led a hard-hat tour of the project, followed by a lavish brunch featuring local delicacies. Less than five months away from showtime, Parq’s sunlit interior was still a maze of drywall and exposed wiring, but he brought it to life. Even when he relays talking points, there’s something disarmingly genuine about Menke, who prefers chatting to texting. To that end, he uses an old flip phone, so he can’t show me photos of Gracie, his beloved Labrador. “She’s more expensive than child support,” he jokes. His father owned a funeral-home business, and his mother was a schoolteacher. Menke’s maternal great-great-grandfather, A.W. Bennett, had been Glendale’s first mayor; on his dad’s side, his grandfather was a local sheriff. Menke thought he would follow in his dad’s footsteps, but the other family business called. In 1983, after graduating early from high school, he enrolled in the University of Nevada, Las Vegas, to earn a degree in hotel management. While attending UNLV, he did an internship with William Bennett’s Circus Circus Enterprises Inc. and the Circus Circus Las Vegas hotel and casino. Menke worked almost every job in the building he couldn’t get tipped for—“My family wanted to make sure that I wasn’t making any money and was sticking by the rules”—from the front desk and housekeeping to accounting and the casino cage. Menke and Bennett launched Paragon with their own money. Looking beyond Nevada, they started in California, where in 2002 they opened the first of several casinos in partnership with First Nations. Paragon then turned north: its first foray into Canada was the River Cree Casino and Resort near Edmonton, a venture with the Enoch Cree Nation, which launched in 2006. Two years later, with the Alexis Nakota Sioux Nation, Paragon opened the Eagle River Casino & Travel Plaza in Whitecourt, Alberta. The company exited the River Cree in 2014 so it could concentrate on Parq Vancouver. That same year, the Eagle River went into receivership. When the Alexis First Nation accused Menke in an affidavit of reneging on his promise to build a hotel, he responded that Paragon had tried to do so in good faith. Paragon concedes that the Eagle River didn’t meet economic expectations, but it says the project delivered economic benefits and infrastructure improvements to the community and the Alexis First Nation. When Paragon bought the Edge­water out of bankruptcy from Libin and Jackson for $43 million that year, the casino was losing $9 million every six months, Menke estimates; it broke even within three months, he says. Around the time of the 2010 Winter Olympics, Paragon struck a deal with PavCo to develop a two-acre parcel of Crown land next to BC Place so it could move the Edgewater’s licence there. The Olympics made an impression on Menke. “I’m a strong believer that that really set Vancouver off on the international stage for all of the great things that are happening now,” he says, citing events such as the 2015 FIFA Women’s World Cup and TED2017. Before Parq Vancouver broke ground in December 2014, Paragon formed an investment alliance with Toronto-based Dundee Corp. and Ottawa’s PBC Group. 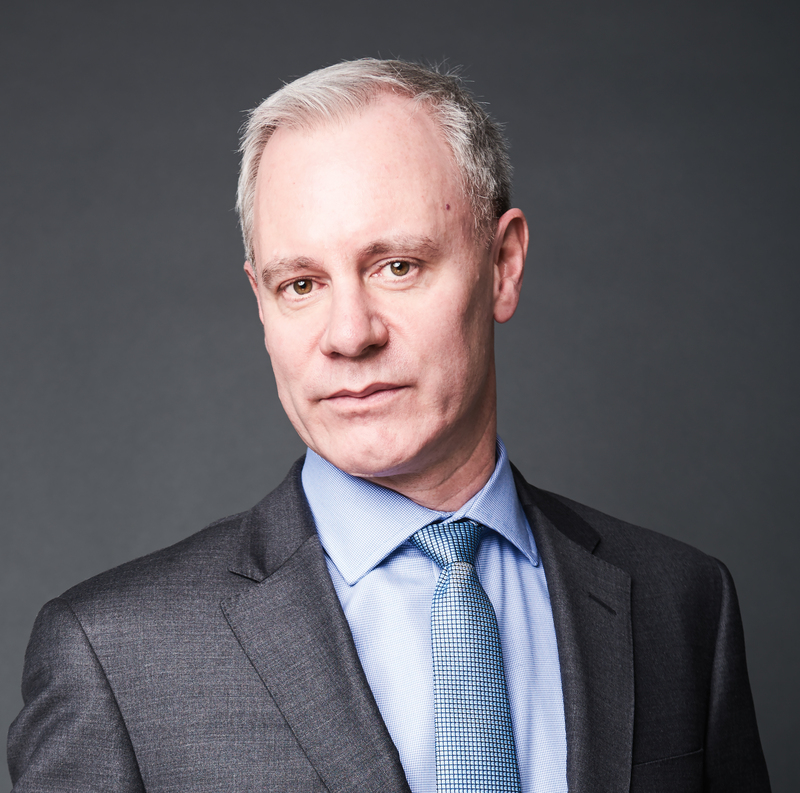 The company hired former BCLC chief executive Michael Graydon as president of Parq Holdings LP. In 2014, the provincial government found Graydon, who negotiated the job while he was still head of the Crown corporation overseeing B.C.’s gambling industry, in a conflict of interest. He resigned early last year. Paragon’s position: Graydon left to pursue other opportunities, indicating that he thought his background and experience weren’t aligned with the business.